Did you know today is "National Pie Day?" Really?! I don't get these "days." But since I had planned to post this recipe later in the week, I decided I'd go ahead and celebrate. 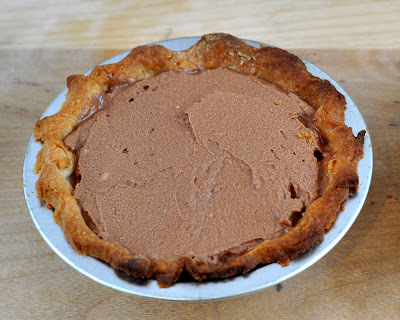 This French Silk Pie recipe is adapted from one I found in an old church cookbook. (Don't all of the best recipes come from an old church cookbook?) This is usually what I make for my husband on his birthday. This year, however, he raised the stakes. 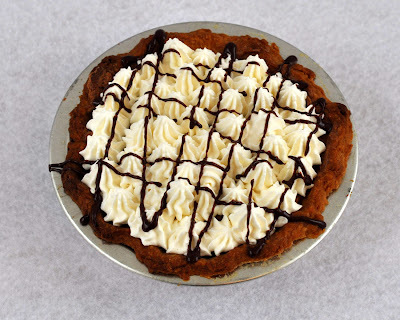 His birthday dessert did involve this pie, but not in a traditional way. You'll see what I mean Friday with "The Most Ridiculous Chocolate Cake Ever." 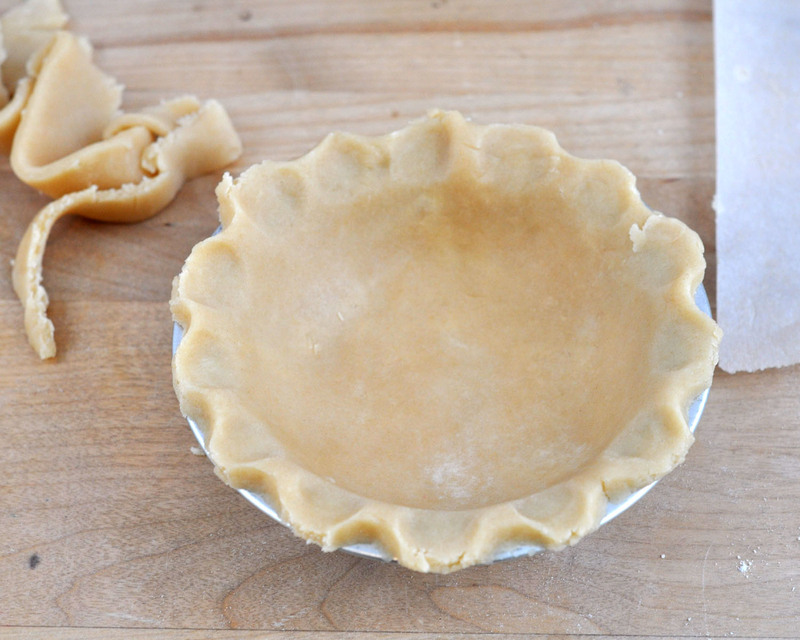 Start with the pie crust. 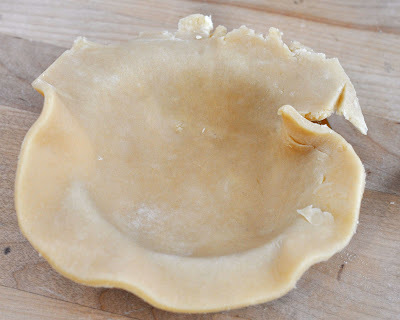 A note about this pie crust. This is my "cream pie" pie crust... not to be confused with my "fruit pie" pie crust, which is a little flakier and not as rich. Yes, I realize only a crazy person has two pie crust recipes, but that's long-since been established. 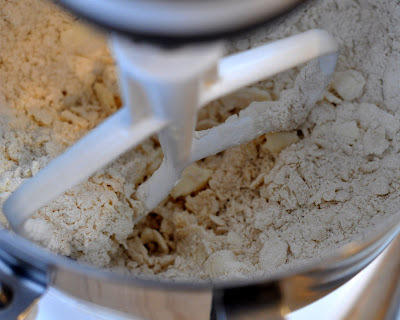 In the bowl of a mixer, or in a medium-sized bow, combine the dry ingredients. 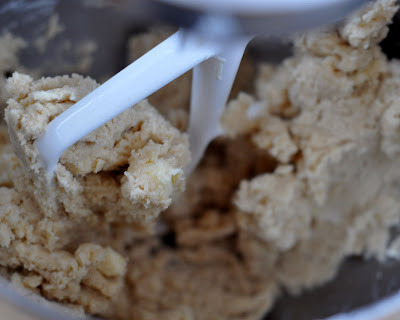 Add shortening and butter, and either mix on low or cut in with a pastry cutter just until you get coarse crumbs, like you see above. 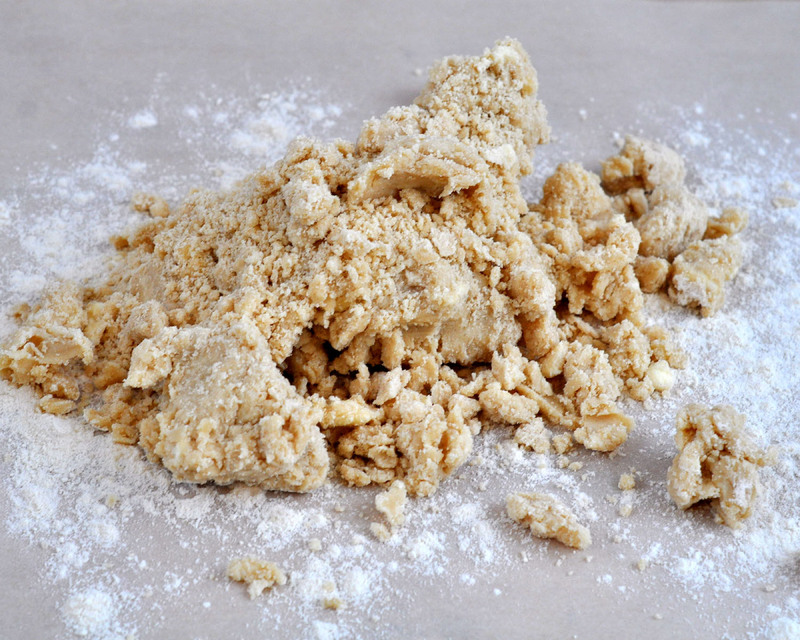 *If you overmix this, it's not flaky at all. It gets all hard like a store-bought crust. Blech. Add the cream, with the mixer on low until it just begins to form a ball. There will still be some crumbs. Again, do not overmix or it will get tough. Turn onto floured waxed or parchment paper. Once it is a ball, divide the dough in half. This recipe makes two crusts for a 9" pie. 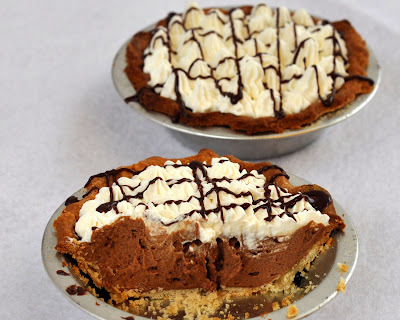 If you only need one (like for this chocolate pie recipe), wrap the other half of the dough in plastic wrap, stick it in a freezer bag, and put it in the freezer for later use. Dust the parchment and the dough with flour again, and roll out to about 1/8" thick. *Note: I am making mini pies in this picture, which I will cut out of a giant piece of dough. If I were making a regular pie, I would have tried harder to make the dough end up in a circle, not the shape of Australia. Now for the part I always hate, when making a full-size pie. Getting it into the pie plate. 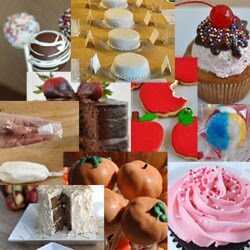 I use the parchment kind of like I do when I make fondant... I slip my arm under the paper, and line it up, then flip it into pie plate. When I take it off of the paper, I find that it cracks and breaks too much. Trim the crust even with the outer edge of the pie plate, and use your fingers and thumb to make the little indentations. I wish I had that third arm to be able to take a photo while I do it, but I'll try to describe... you press the thumb of your left hand down, towards the pie while you press two fingers of your right hand away from the pie, creating the "waves." Lay a piece of parchment (not waxed!) paper inside of the crust, and fill it with dried beans. These will weigh the crust down so it doesn't shrink while you bake it. Bake a full-sized pie at 425 for 30-40 minutes. (Remove the parchment & beans with about 10 minutes left at the end to get the middle/bottom golden brown.) These mini pies only took about 12-15 minutes. Let the crust cool while you make your filling. And important note... EVERYTHING needs to be room temperature for this recipe. 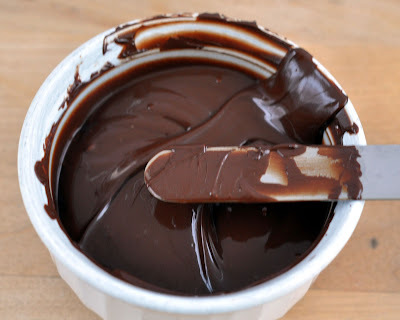 The melted chocolate can be slightly warmer, but nothing can be refrigerator cold, or you'll get clumpy filling. 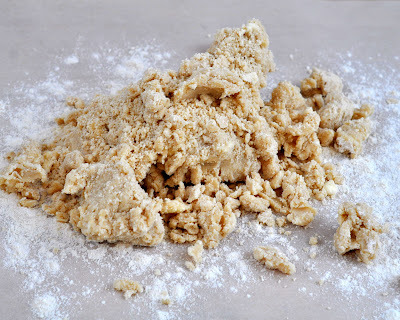 *The original recipe called for granulated sugar, but I didn't like how it was gritty, so I use powdered. However, I think the powdered sugar does end up making the filling a little more "solid," so use your judgement if you like it a little looser. Add the eggs, one at a time, or the pasteurized eggs 1/4 cup at a time. 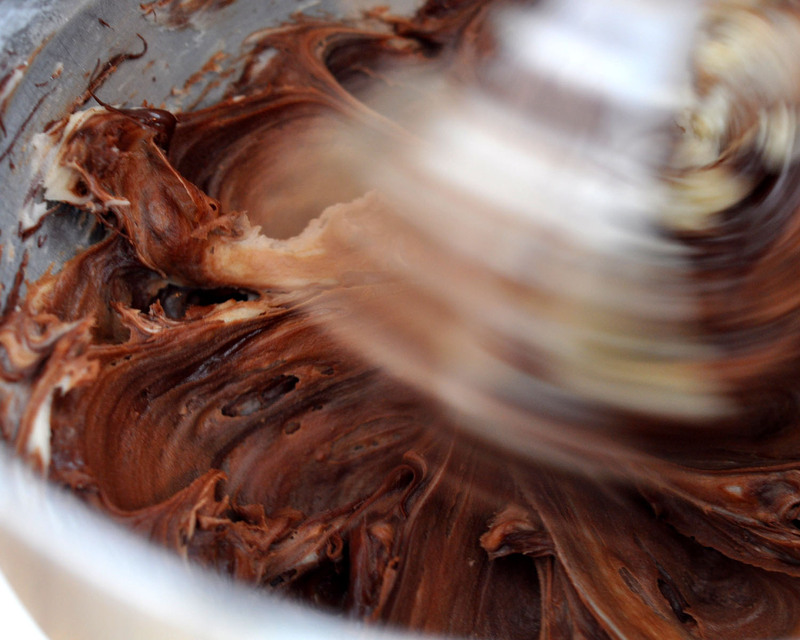 Mixing for a full minute after each addition until it looks soft, light and silky like this. This is where you want to be a little careful. Try to use a low speed, and watch that you don't overmix or it can separate a little, which is kind of what happens to mine almost every time because I forget to pay attention. It still tastes awesome. Spoon the mixture into cooled pie crust(s). Top with whipped cream and a drizzle of melted chocolate. 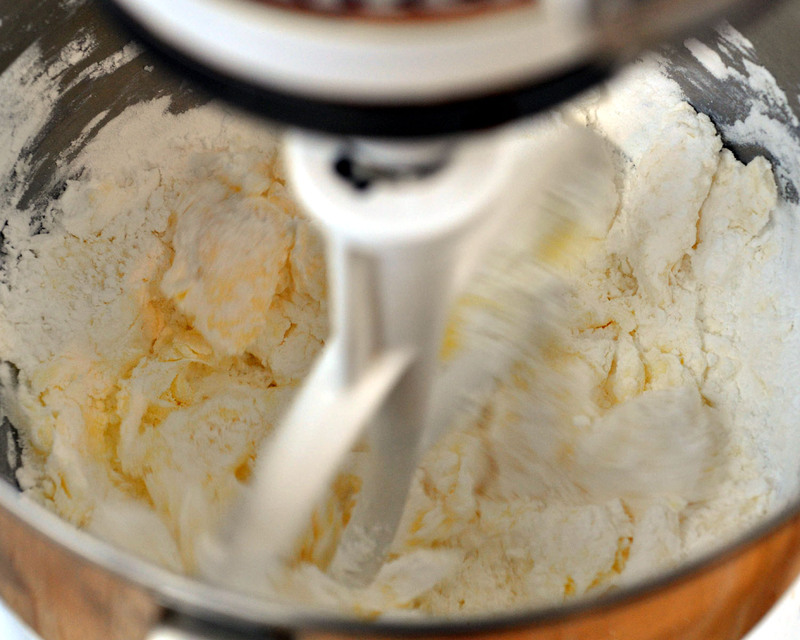 Combine the cream & powdered sugar in the bowl of a mixer. Mix on high until stiff peaks form (mine took about a minute). 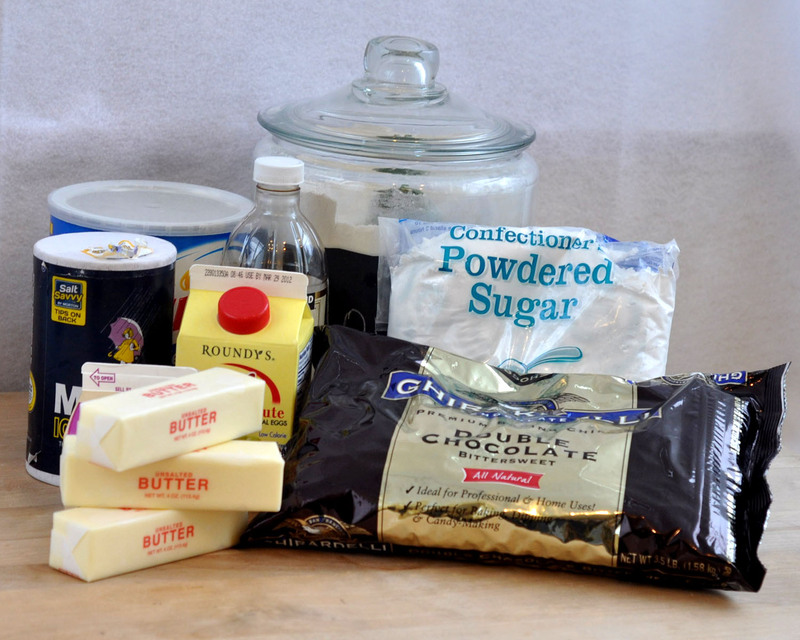 Add vanilla just before you turn off the mixer. 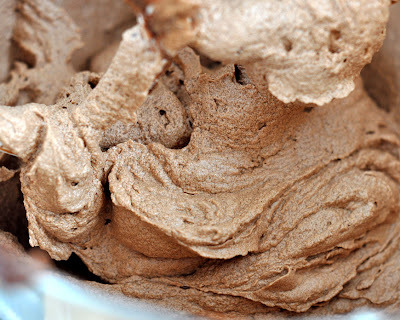 Click this link if you would like to purchase a one-page printable version of this recipe for $1. The link will take you to PayPal, where you will enter your email address when you pay. I will then email you a .pdf version of the recipe complete with photos and instructions. OK, I finally figured out how to do a pie crust into a pie plate. 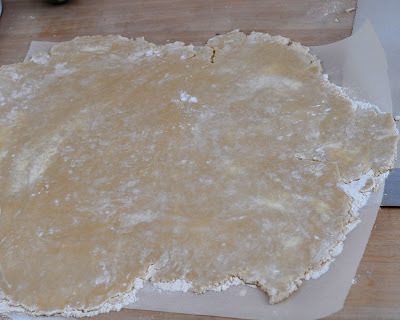 Roll the crust out on parchment paper, 2.5 gallon Hefty zip bag, etc. ... I suppose you could use a cutting board, too. Not the counter top! Put the pie plate, inverted, on the crust. Carefully center it. Slide the pizza peel under the paper, bag, whatever, and holding the inverted plate, invert everything. Remove the peel and paper. Tada! Trim. Excellent. Made it following the recipe exactly. Sweet and rich...it was a hit with the entire family. Just starting to learn french cooking.